We left off yesterday, on a Monday, when I had enough yarn, enough posters put up about town, some circular needles, and no one registered yet for my class on knitting socks with circular needles. And then there’s the issue of privacy, what privacy? Tuesday It was the second week of January; I was knitting socks at the hospital, as I was keeping watch on my mother. The nurses were very intrigued by my sock knitting, not only by the fact that I was knitting socks (who does that anyway, when you can buy socks for $10? ), but by the intricate design (A. Zilboorg) and the method I used. They also saw me writing up more posters with details on the room where the course would be held and for which I had not a single registration. Wednesday One Romanian nurse was quite taken and signed up for the course. Wow, I thought, it might work after all. She said other nurse friends were also interested in attending. « Of course », I said, « but they better sign up fast, I only have a few spots left.» White lies. They make the world go round. By the end of the day, I had 5 registered participants. The reason for the course was for me to have fun and pass the time, 5 was good enough to go! Thursday In the meanwhile, I had gone to the 2 local wool stores looking for circular needles, 3mm – 100cm that would be included in the course package. I had plenty of wool to provide a nice selection of colors from which to choose for the participants. Did I mention that socks are knit with DPNs in Italy? Plenty of those around to buy, but circular? Not that readily available. And everyone told me that circular needles in 100cm did not exist. I started carrying my own 100cm ones to prove that they do. 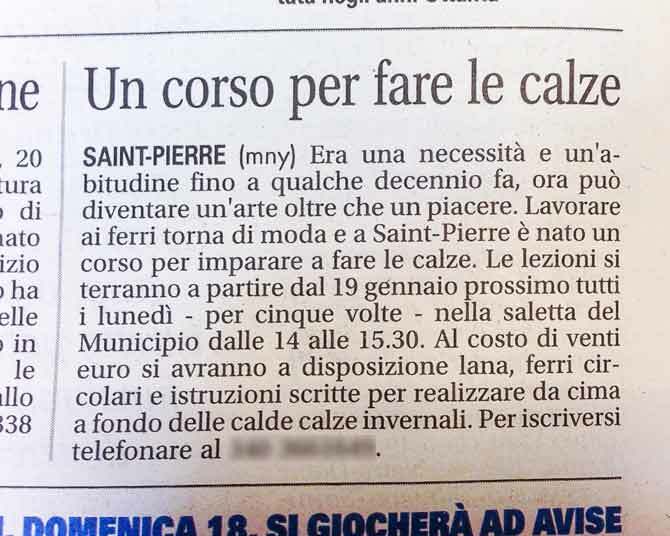 A bit of a panic ensued, as I had exhausted the stores in the « big city » (Aosta, pop. 130K) and only had 3 sets of 3mm – 80cm circular needles. I didn’t particularly like them, not only were they a tad short, but they were the ones with the stiff, clear plastic cable that never untwists. I was still 2 pairs short, but I could always throw in my own pairs, to start off and then order them from Canada or something. 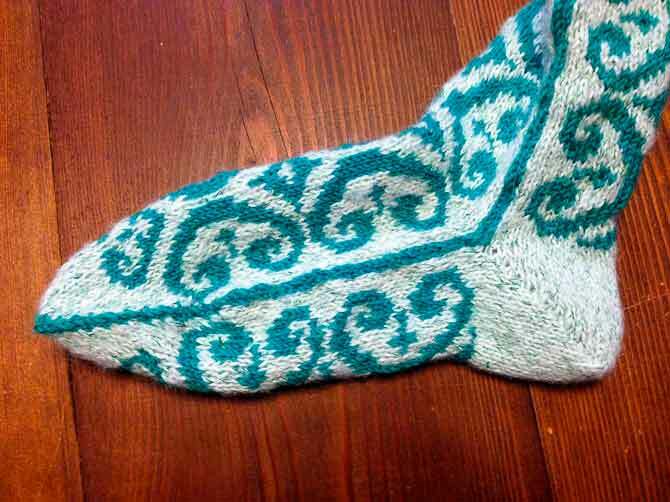 I had written up a course manual on how to knit two socks at a time, starting from the toe, following very much what I had learned from Melissa M-O. I had 8 photocopies made up for good measure. I bought the bags at the dollar store (yes, there is a Euro store in Aosta), and placed a copy of the handouts in a protective plastic sleeve. 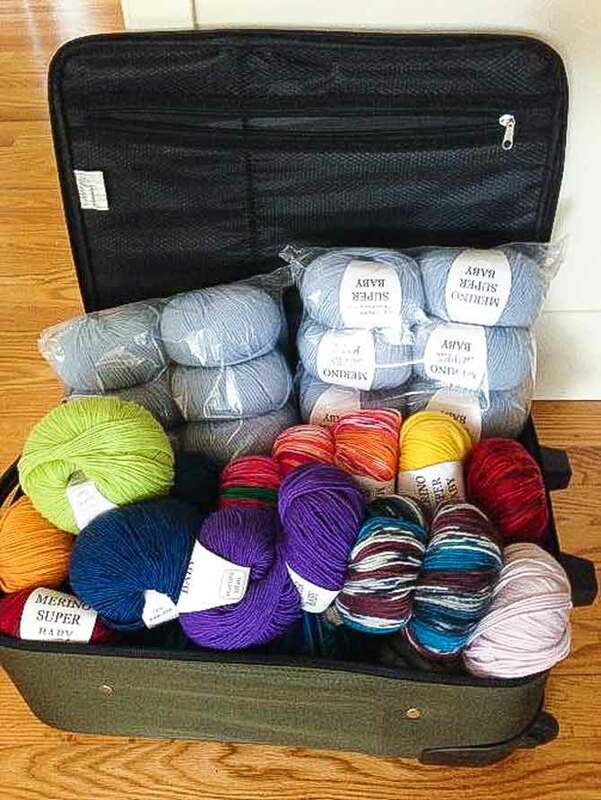 I filled a suitcase with colorful wool, and waited for the phone to ring. I set up a WhatsApp Group for the 5 participants to use as a forum for their questions and for me to send out videos of techniques. Friday The course was to start on Monday, still only 5 participants. Saturday « La Vallée » hits the streets. This is the weekly provincial newspaper that speaks to the locals about their valley and events. It’s a mix of small town gossip with pictures of local gym clubs, cultural groups, artisans, and national news. 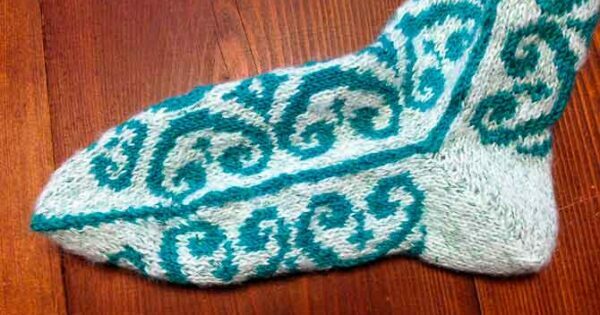 Then, I received a call from a lady who asked if this was the right number for the sock knitting course. Yes, I said. She had read the article in the newspaper and wondered if there was still room to sign up. « The newspaper? », I asked. Within a few minutes, I had 15 registered participants. Sunday More calls came and I started a standby list. Monday morning I was short 7 sets of photocopies, bags, and needles. Plenty of wool though. The course was starting at 14:00. Stores open from 8-12:00. I drove to every yarn shop within reach of the main road where all the towns originate (the Valley is about 80 km long), bought up all 3mm 80cm circular needles I could find and rushed home for a quick lunch and a shower. It’s illegal in Italy, as it is in Canada, to answer calls on your phone while driving, unless you have a hands free set up. I drive an 8 year old car. No hands free. The phone kept ringing with local, but unknown numbers showing up. I would return calls when I would stop at stores, and jot down names and numbers to the ever increasing standby list. I accepted one more registration despite the class being full. A young, educated person at the other end of the phone said she was calling for her mother to inquire about the course. The mother had read the ad in the newspaper and wanted to join up. The woman wanted to « warn » me that her mother was 71 years old. I thought it was an odd thing to say, but something in the tone of the speaker intrigued me. I answered that there was no age limit and that the course was about having fun and learning something new. If she was up for it, she was welcome. Lina did show up for the course. After suffering several strokes and other illnesses, her doctors had suggested taking up knitting as part of her rehabilitation. She turned out to be the star of the class.